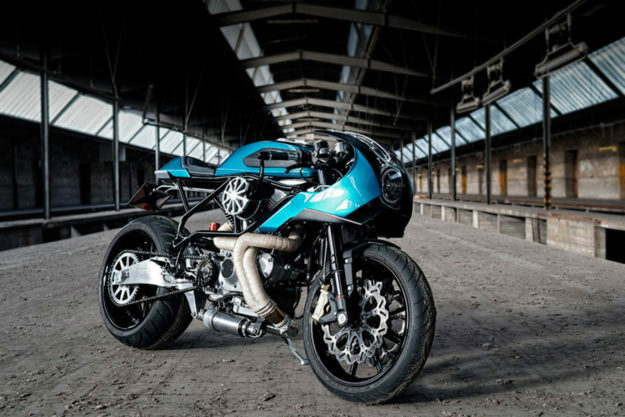 Buell M2 Cyclone by Officine Urgani Even the most ardent Buell fanboy would have to admit that the M2 Cyclone is an ugly bike, even by Buell’s admittedly variable standards. The M2 wasn’t a bad bike though, and with 91 hp on tap from its 1200cc Harley V-twin, it had a fair turn of speed. 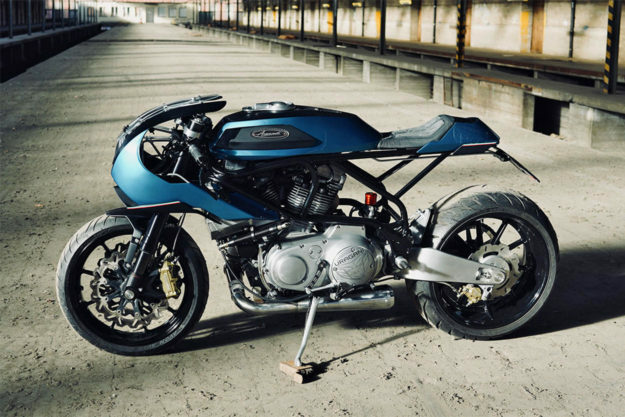 That makes the Cyclone the ideal platform for a café racer job, and Raffaele Gallo of Officine Urgani has delivered, big time. In his workshop in Baden-Wurttemberg, Germany, he modified around 80% of the frame, and then installed completely new aluminum bodywork. The tank design is especially inspired, with a glass insert for monitoring the fuel level. And that deliciously curved front fairing, fashioned from four separate pieces, also hides the oil tank. All the wiring and mounting points on this Buell are now hidden, and no bolts are visible to break up the smooth surfaces. 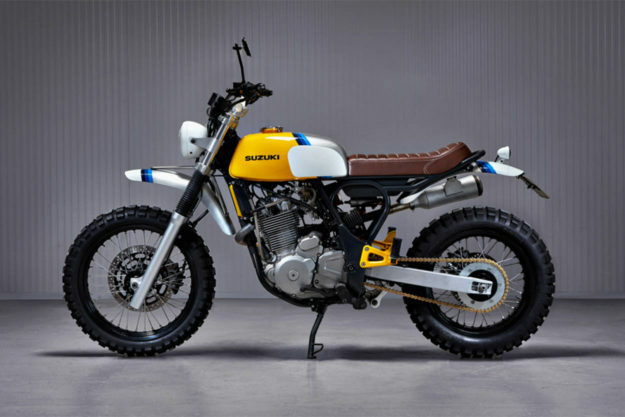 Suzuki Scrambler by Martin Schuurmans Schuurmans is a product designer based in Eindhoven in the Netherlands, with a background in furniture design. He’s also just built a sharp-looking scrambler that doesn’t compromise practicality too much in the name of aesthetics. It’s based on the 2001 Suzuki XF650 Freewind, an ‘all-rounder’ that probably had the BMW F650 in its sights. After overhauling the engine, Martin fabricated a new subframe, seat, fenders and battery box, and modified a Honda CB350 tank to fit. He’s also added new stainless steel exhaust headers, a SuperTrapp muffler, and a custom oil cooling system. 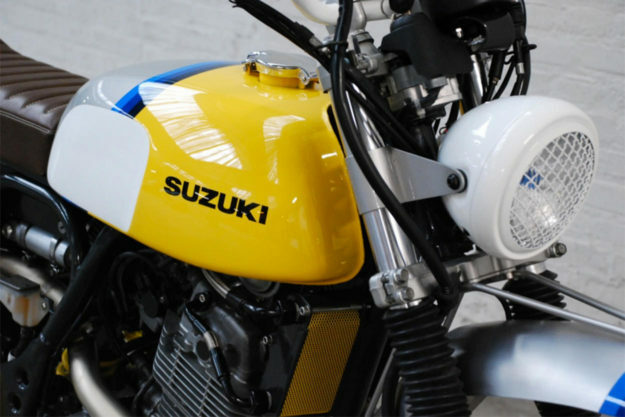 The paint job is inspired by classic Suzuki dirt bikes from the 80s—with the yellow matching the color of Dutch license plates. 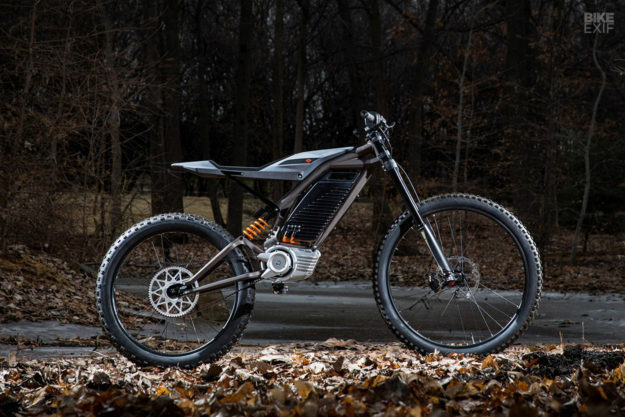 Harley-Davidson electric concept bike Milwaukee appears to be going all-out on the electric front at the moment, and not just with the LiveWire: at the huge CES tech show in Las Vegas last week, it showed a pair of electric concept bikes. They’re hard to categorize, but the one shown here resembles a beefed-up mountain bike, while the other is closer in form to a motorized scooter. Information about the concepts is practically non-existent, but the bigger one looks especially interesting. According to our PR contact at Harley, Joe Gustafson, it’s designed to “make off-road experiences accessible” and it’s aimed at people who don’t yet have a motorcycle license. The battery is removable and can be carried back to an apartment or office space to charge using a 120V charging dock. 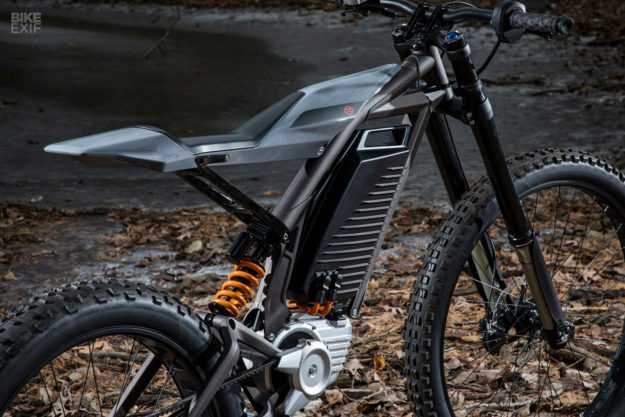 Joe’s at pains to point out that “the lightweight electric concept bikes are just that—concepts.” Still, it’s another sign that Harley is focusing on the future, and not just regurgitating its past. Which can only be a good thing, right? 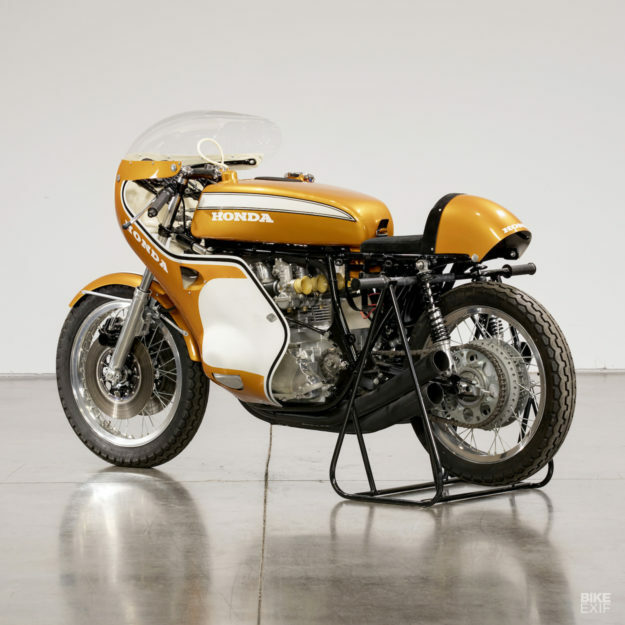 Honda CR750 Factory Racer Mecum’s upcoming auction in Las Vegas on Jan 22-26 includes some mouthwatering machinery. For us, this incredibly rare Honda is the pick of the crop. The estimate is a jaw dropping $200,000-250,000, but that simply reflects the impeccable provenance of this racing motorcycle. 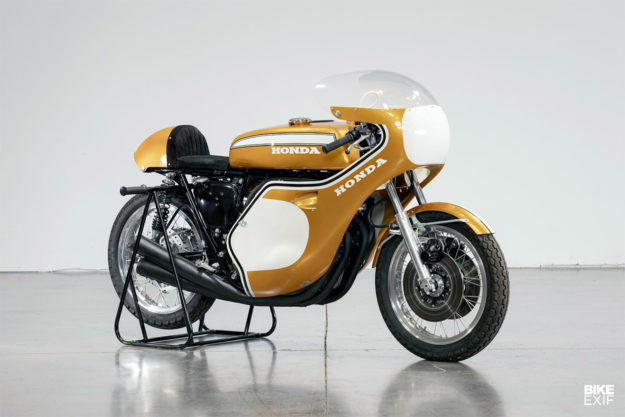 It was delivered from the Honda race shop in Japan to its Swedish importer Autohansa in 1971, but due to a broken connecting rod, hardly ever raced. 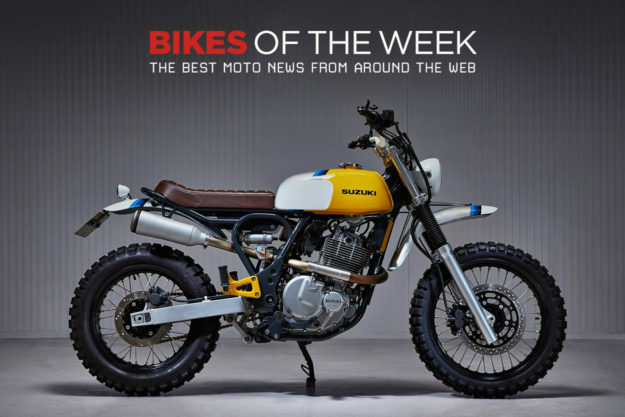 Every component on the well-documented bike is original, aside from the seat— which was stolen at a race meet and has since been replaced by an accurate replica. 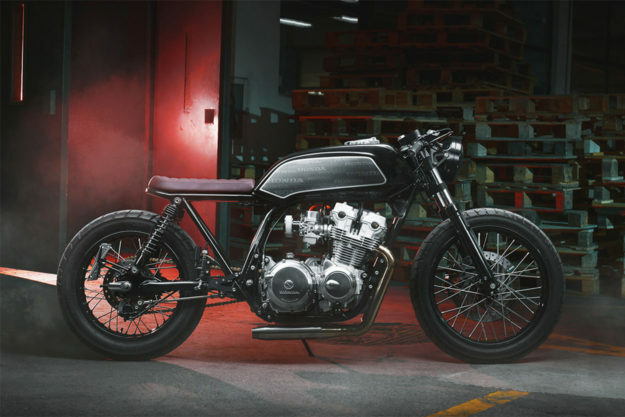 Honda CB750 Four by Thracian Custom Bikes Our pockets aren’t deep enough to shell out for the CR750 but we love 1970s Hondas, so this classic café racer from the Bulgarian shop Thracian would suit us just fine. We haven’t come across builders Miroslav Vulkov and Plamen Nikolov before, but we’re going to be keeping an eye on them. 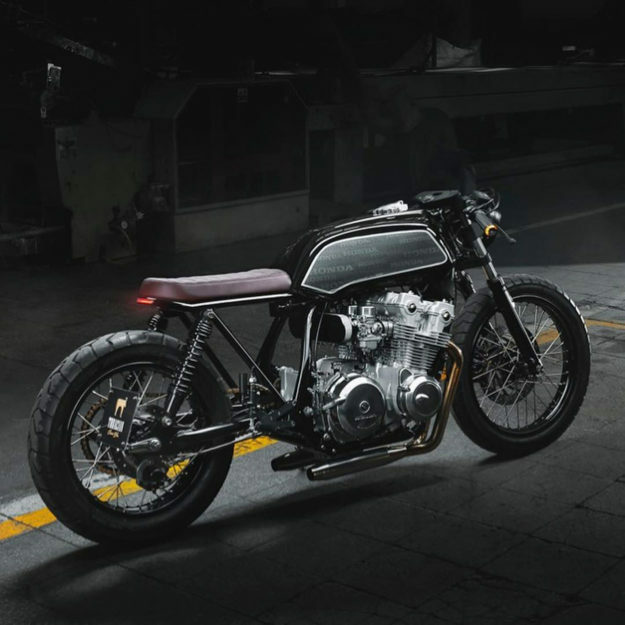 They spent 600 man-hours revamping this 1983 CB750 Four after importing it from Germany, and it shows. The wheelbase is extended, the frame is shortened and the forks are slammed. Some 25 kilos have been trimmed from the weight, with every component stripped down and renewed, right down to every last nut and bolt.